A good close on Friday for the stock market after a tester on Tuesday that was caused by a dramatic rise in Italian interest rates. We will be back to Italy and the Euro zone in the future. 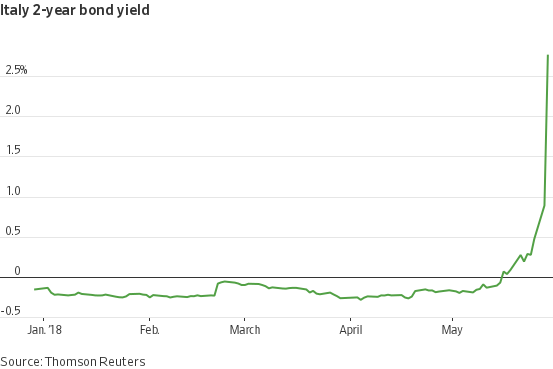 For now, the local Italian banks and the ECB bought up all those higher yielding Italian bonds after Tuesday so the crisis is “over” while the politicians in Brussels groom their next Manchurian Candidate to lead the ECB. A triangle is a continuation pattern which means that the uptrend from the 2009 low is likely to continue in the coming months. This may be the last leg of the bull market but it may present some very good investing opportunities in some of the stronger sectors such as technology. 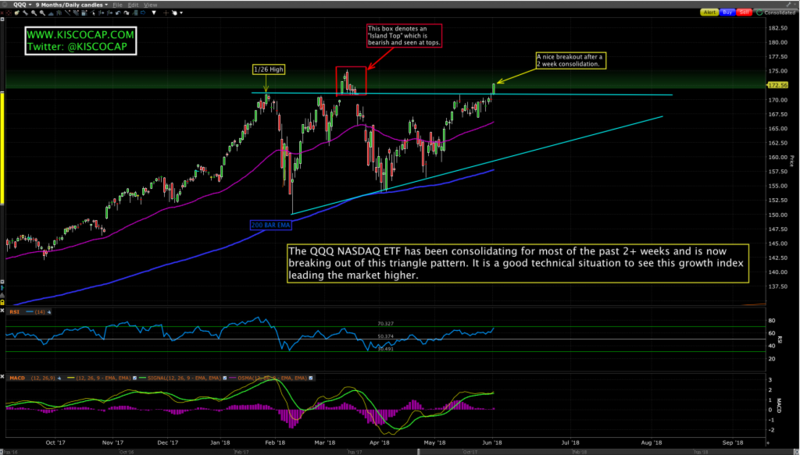 How long will it last – much tougher to use technical analysis to predict that but it should last several months. 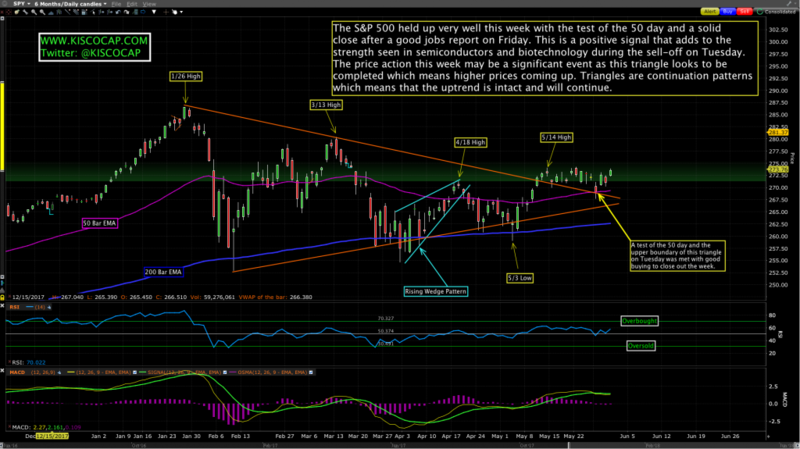 Just a few more sessions and the S&P 500 should get moving towards new all-time highs. Ciao to the correction of 2018! The EU unemployment rate in April did hold at 8.5%. The forecast was for a one tenth drop but it still is the lowest level since December 2008. (Boock Report). A separate report showed US construction spending grew 1.8% m-o-m in April, exceeding estimates. That was the biggest increase since January 2016. Total private construction grew 2.8%, with spending on residential buildings rising 4.5%. The data showed the labor market remains strong with hiring ramping up in May, unemployment falling to a fresh 18-year low and a faster than expected rise in wages. Overall Friday’s reports paint a healthy picture of the US economy and are likely to keep the Federal Reserve on track to lift interest rates when it meets in June. The U.S. operation of Germany’s troubled lender has been put on the FDIC’s list of “problem banks,” according to the FT. The FDIC isn’t commenting, citing policy not to publicly identify banks on that list. For its part, Deutsche Bank tells the FT it’s very well capitalized. Moody’s on Thursday raised its outlook for the US steel industry after the Trump administration said it would start imposing tariff on steel and aluminum imports on Friday. 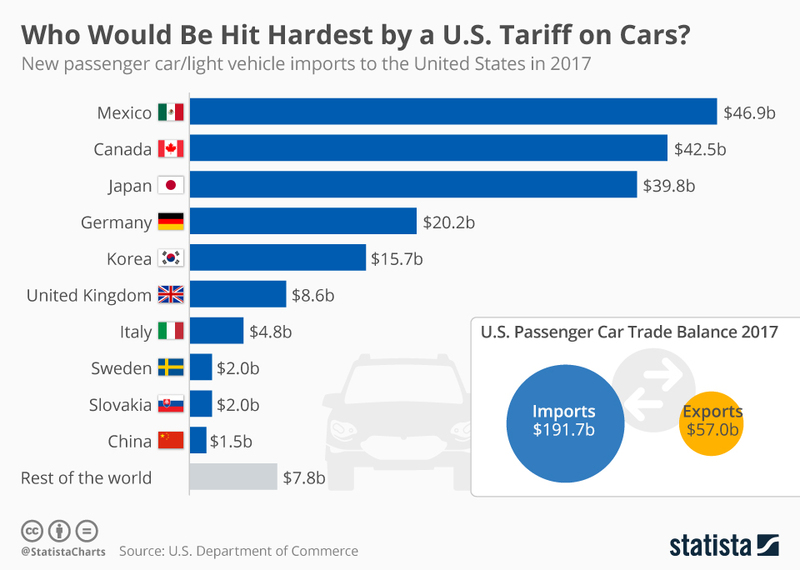 The credit rating agency raised the 12 to18-month outlook for the sector to “positive” from “stable” on improved demand, shortly after the US announced said it would proceed with tariffs on imports from EU, Canada, and Mexico.